Local War Memorials :: Great War Dundee - This is the story of the 30,490 men that left Dundee to fight in the First World War and of the people left at home. During the First World War a decision was taken not to bring home the bodies of the men who had died, but instead to bury them near where they had fallen. There are about 1,000 cemeteries in France and Belgium alone. However grieving families wanted somewhere to go to remember their loved ones and this is why many local war memorials were built. Nowadays, these memorials are still used as a place for remembrance, especially on the 11th November. 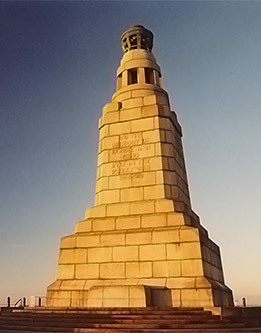 There is a beacon at the top of the Law memorial and this is lit on important dates to remember, such as the 25th September, to commemorate the Battle of Loos, and 11th November, Armistice Day. The Law memorial does not show the names of the fallen; however paper copies of the Roll of Honour can be viewed at the Local History department in the Central Library and at Dundee City Archives. You can also search the Great War Dundee Roll of Honour for more information. Many other Dundee institutions, such as Police, the University of Dundee, and the Post Office also wanted to pay tribute to their fallen members and workers. Typically, a plaque listing the names of those who died was erected, however the Dundee General Post Office also created a memorial time capsule to commemorate their fallen workers. 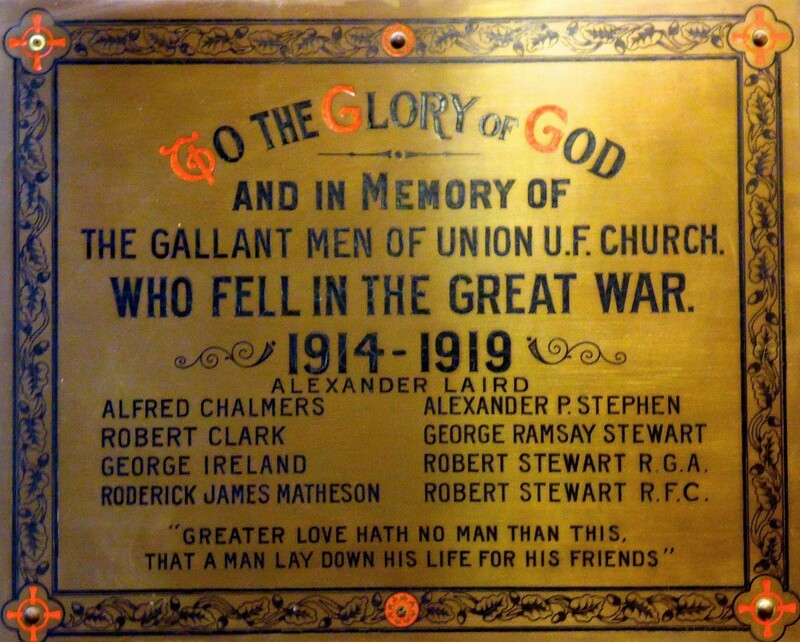 Some Dundee schools and most Dundee churches also have a memorial; churches often have a brass plaque inside the church listing the fallen soldiers who had been part of their congregation. Memorial plaque at St Stephen’s and West, Broughty Ferry. There are also war memorials in the towns and villages around Dundee. These can vary in style and design. In Monifieth, the memorial is a tall pillar and at the top is a robed medieval knight holding a sword and wreath. In Carnoustie, the memorial monument lists the names of soldiers who died during WWI and WW2. Many memorials can be found in and around Dundee. If you would like to add a memorial to the list, please get in touch. Photograph kindly supplied by Christine Johnston.